Staying on top of cleaning chores can be quite a challenge. Finally I have a cleaning checklist that works for me. Inspired by this one from clean mama, this very simple routine (just the way I like it!) is customized the way that I wanted. Without further ado, here it is. This image shows an example of how it works. Every day there are daily tasks, plus one weekly task to do. In the example, the first two weeks of the month of January have been completed, with daily tasks checked off. The first week the office was cleaned, and the second week, the guest room was cleaned. By writing the letter for the weekly task completed in the appropriate column, it is easy to see at a glance what was done when, and what will be next. For the other rooms Tuesday through Friday, ideally all of the tasks are completed, but the letters also work well with the monthly tasks. 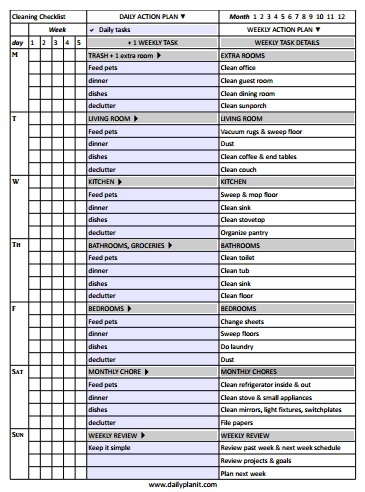 Print the cleaning checklist (pdf) each month and you are ready to roll. I put mine in a Scotch display pocket and hung it with a magnetic clip on the refrigerator. Progress can be tracked with a dry erase marker. I love the way that tasks are spread out…not so overwhelming! If you like this, you might like to check out resources at the Home Helper Toolkit and my Household Binder Notebook board at Pinterest.